A privy in the Adirondacks. Use 'em if they're there! If you've been camping, hiking, or outside for more than a few hours at a time, odds are you've had to deal with doing your business outdoors. Proper management of human waste outdoors can help avoid pollution of water sources, avoid unwanted encounters with human waste during your outdoor experience, and keep plants and animals from being unnecessarily exposed to things like that stray piece of toilet paper. So what does proper disposal and management of human waste look like? 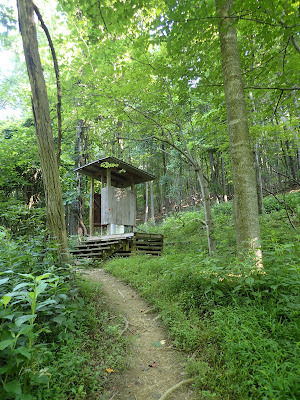 Most campgrounds maintain bathroom facilities, as do many popular trailheads. 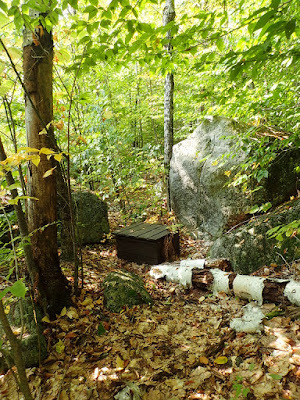 I've also stayed in primitive campsites that have outhouses and privies. They can be as small as a box a few inches above ground, almost completely camouflaged, or as big as an outhouse. If they're available, use them! But some come with rules. On the Pemi Loop in New Hampshire, the campsites we stayed in had composting outhouses, but clear instructions to avoid urinating in them were posted all over the walls. Excessive dampness compromised the composting abilities of the outhouses, which I'd never run into before. It's important to know as much as you can, and observe rules. No facilities available? Try these guidelines. 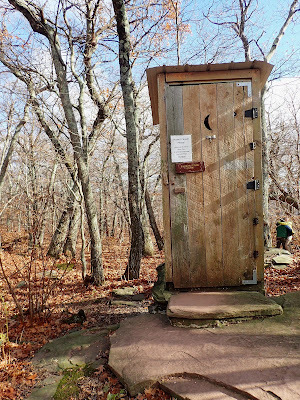 A beautiful little outhouse in the Catskills. Packing out solid human waste and everything associated with it is the best way to minimize your impact. Products like WAG Bags have been around forever, and may be required depending on where you're adventuring. We were required to take them into the backcountry in Colorado due to the number of visitors the area sees. They'll also be useful, even required, in alpine areas and mountains with snow. If you want to leave nothing but footprints, this is the way to go #2 outdoors. I've also carried a plain plastic bag wrapped in duct tape to hide what's inside. Absolutely can't pack out your waste? Dig a cathole. Dig in a carefully chosen location that minimizes the chance of water pollution, or anyone and anything finding what you're leaving behind. 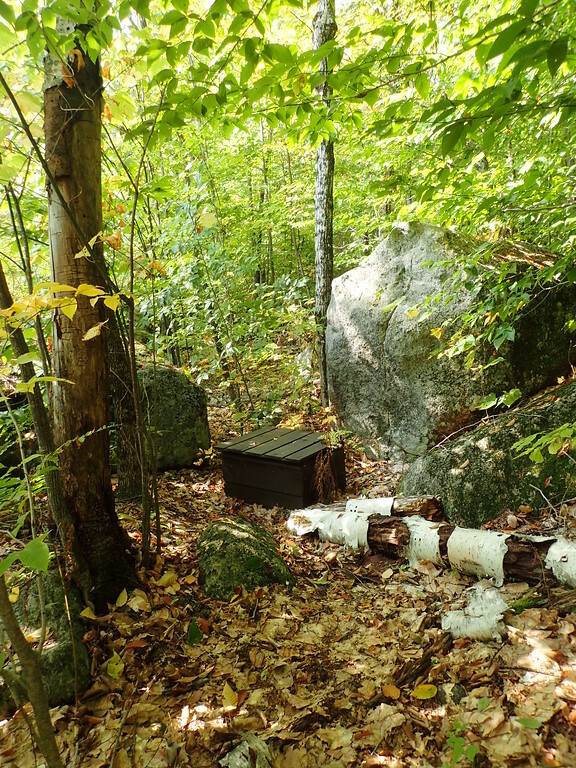 Leave No Trace principles call for a hole "at least 200 feet (about 70 adult steps) from water, trails and camp" in an inconspicuous location where others are unlikely to walk or set up camp. The hole should be "6-8 inches deep and 4-6 inches in diameter, and covered and disguised with natural materials when finished." Any lightweight shovel like this or this is perfect. Staying multiple nights in one place with a large group? Consider a latrine. They're not ideal because large concentrations of human waste take longer to decompose. But if you're camping in a large group for multiple nights, or have kids with you, they're an option. Use the same methods you'd use for selecting a cathole location, and toss a handful of dirt in after each use. Dealing with feminine products? Pack them out. Tampons don't easily decompose and animals might dig them up if they're buried. Take a plastic bag with you to keep them in until you're back in civilization, and you can always wrap it in duct tape to hide the contents. What about urine? Urine generally has less of an impact on plants and soil, but still try to urinate on rocks, pine needles, or gravel, based on Leave No Trace advice. 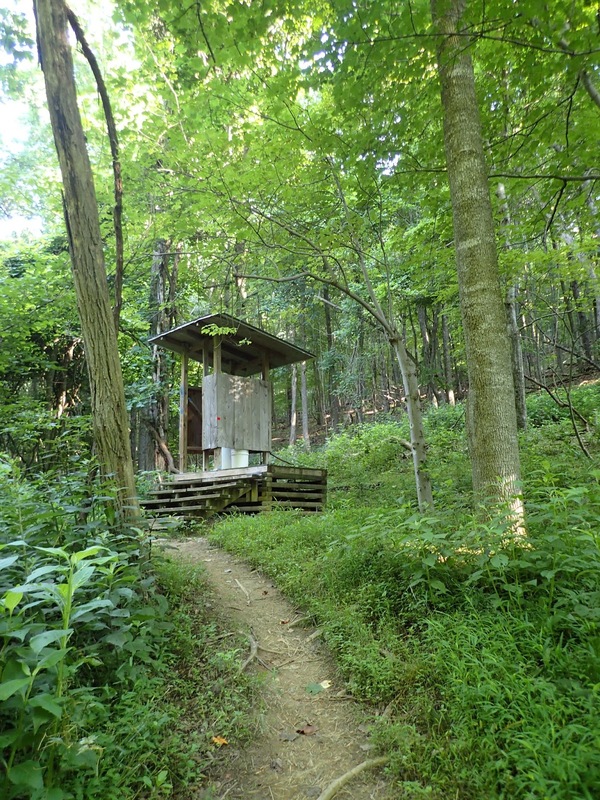 A door-less outhouse in Virginia off the AT. And what about toilet paper? There's nothing worse than seeing a stray piece of bright white toilet paper near the trail when you're hiking. Help make everyone's experience more enjoyable by packing it out. If it can't be packed out, bury it as deep as possible in a cathole. Doing research ahead of time will help you understand what your options are, and if you'll need WAG bags and other items. No matter what, on longer trips, I'll take a giant plastic bag of supplies (roll of toilet paper, bottle of hand sanitizer, latex gloves), and another plastic bag to hold the toilet paper until I'm back in civilization. On day hikes, Sh!t Kits by Potty Packs are perfect. The Sh!t Kit comes with four feet of two-ply toilet tissue, wet wipes, hand wipes, hand sanitizer, and a disposal bag to help pack everything out. You can carry your own collection of supplies, of course, but the Sh!it Kits are super easy to throw in your backpack before you head out. Have you used a WAG bag before? Used an outdoor privy? Dug a cathole? Have other creative, discreet methods for packing out waste and toilet paper? Leave a comment!